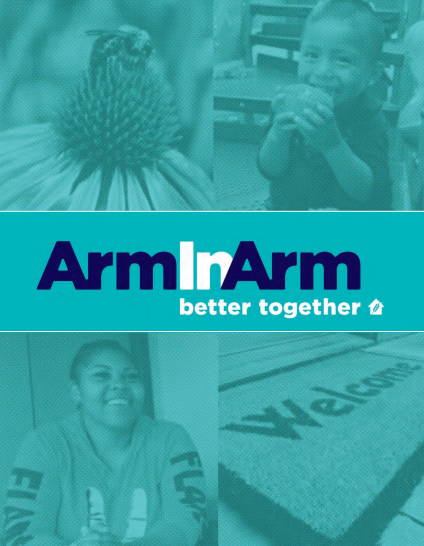 Arm In Arm’s three pantries provided food for shoppers nearly 21,000 times in 2018. We welcome individuals and groups of up to 10 volunteers to join us in this work at our Trenton pantry locations. Pantry volunteers may act as personal shoppers, unload and shelve donations, package groceries for our home delivery program, or deliver groceries to our mobility challenged and older neighbors. Located on site at our East Hanover Street location, the Arm In Arm garden helps supply fresh local produce to our pantry customers, while also serving as a green space in the city. We regularly need volunteers to help water and tend the garden during our growing season, typically May through October. Talk to your school or congregation about sharing a portion of their community garden harvest with Arm In Arm. Welcome Home Packages help families and individuals in our case management program move into a home and start on the path to long-term stability and self-sufficiency with supplies for cleaning, kitchen, bed, bath, and more. To arrange a welcome home basket project, please contact Vanessa Lagares. Community food drives, organized by our partner, Yes We CAN! Food Drives, take place throughout the year at local grocery stores and farmers markets. To learn more about these opportunities, please contact Shariq Marshall or Alison Politziner (Yes We CAN!). Guide adult work trainees as they improve their internet navigation and communication skills, complete web-based and written employment applications, and engage in job search follow-up. Mentors may choose to meet with clients on site at our Trenton locations, or schedule at least five mentorship calls to take place over the course of the program. Help workforce development clients build their confidence and professional communication skills by volunteering as a practice interviewer. We need volunteers to help with on-site mock interviews and to conduct practice phone interviews remotely. Volunteers may sign up to come in or make calls as needed, Monday through Thursday 9am-3pm. Whether greeting clients as they come in, assisting with administrative tasks, or interviewing applicants, our homelessness prevention and housing stability volunteers help build a positive and efficient environment to ensure our clients receive the resources they need. Have a special skill you would like to use to help Arm In Arm? Please contact Shariq Marshall to discuss custom volunteer opportunities. Ready to volunteer? Sign up now!